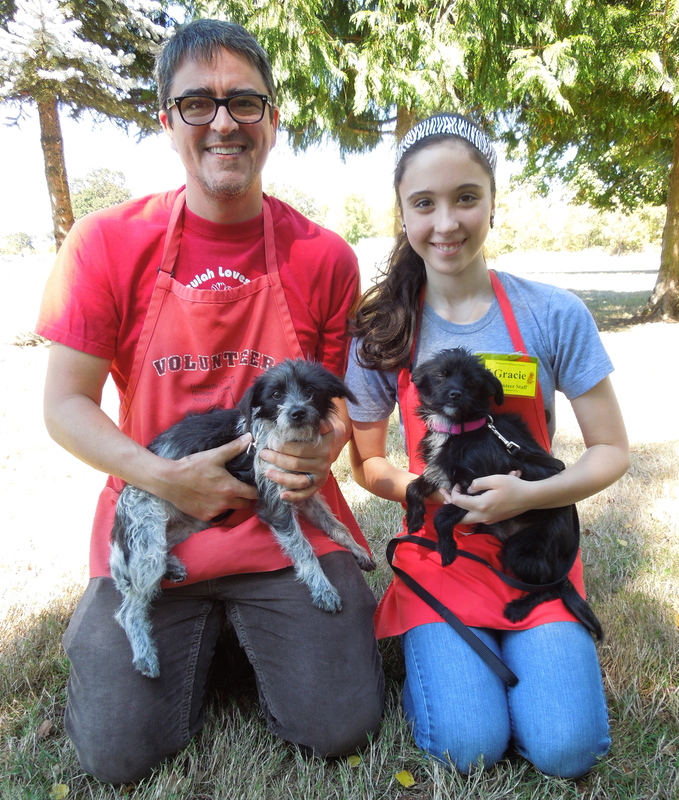 Last Saturday evening Willamette Humane Society held its first Yappy Hour, an adoption alumni reunion and volunteer social. There was food and drink along with many former WHS dogs and their families. We had a wonderful evening and I took lots of pictures. The success of the day meant it won’t be the last such event. Here is a slideshow of the fun! I was worried that the adoption rate might slow down once the summer was ending, but so far, happily, that isn’t happening. 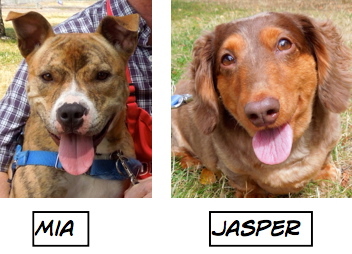 Here are last week’s Blog Dog adoptions. Sunday’s play group participants were especially talkative. 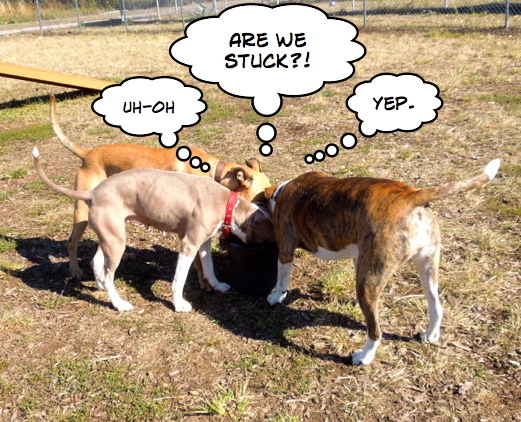 Here’s some of what I overheard as the dogs romped. 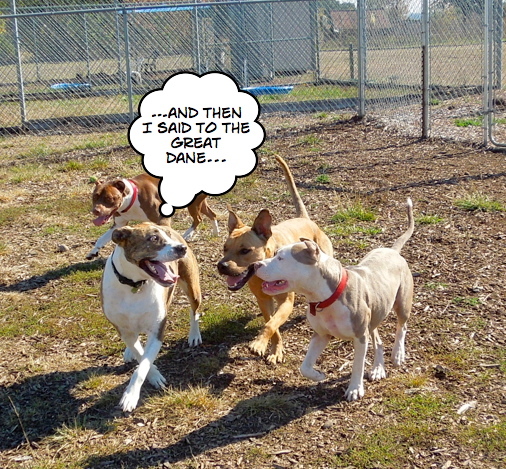 Kya (volunteer Sherrie’s dog) always tells a good story. Here Jax and Faye listened closely. It’s always exciting when a new person joins in the fun. 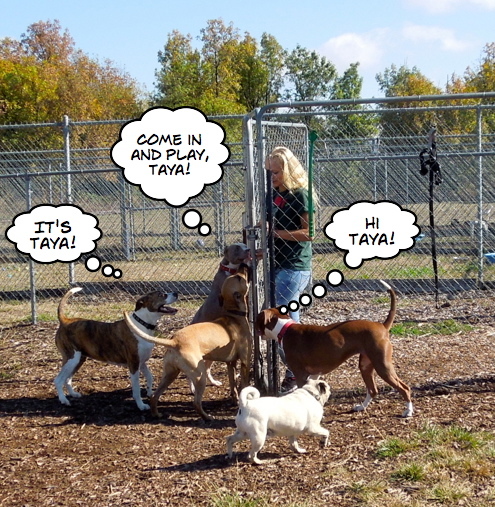 Here is the welcoming committee greeting Taya. Yes, dogs pass on rumors, too. 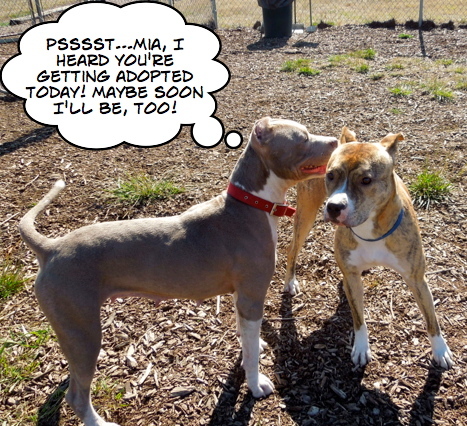 Faye couldn’t wait to tell Mia what she’d heard. And she was right! Mia went home that afternoon. The water bucket was quite popular! Kya tried to show Gorgeous how to drink out of the hose. I’m a PUPPY! I LOVE life! 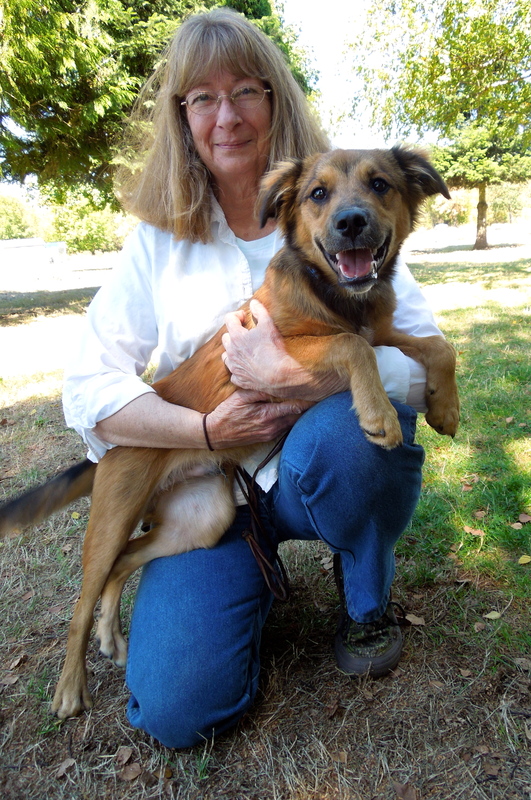 When I was taking pictures of new dogs on Sunday, volunteer Linda brought out Tim for his photo shoot. She had already fallen in love with the little guy before she reached me. Tim is a six-month-old Shepherd Spaniel mix with a ton of energy. He would benefit greatly from taking some of WHS trainer Annie’s classes. 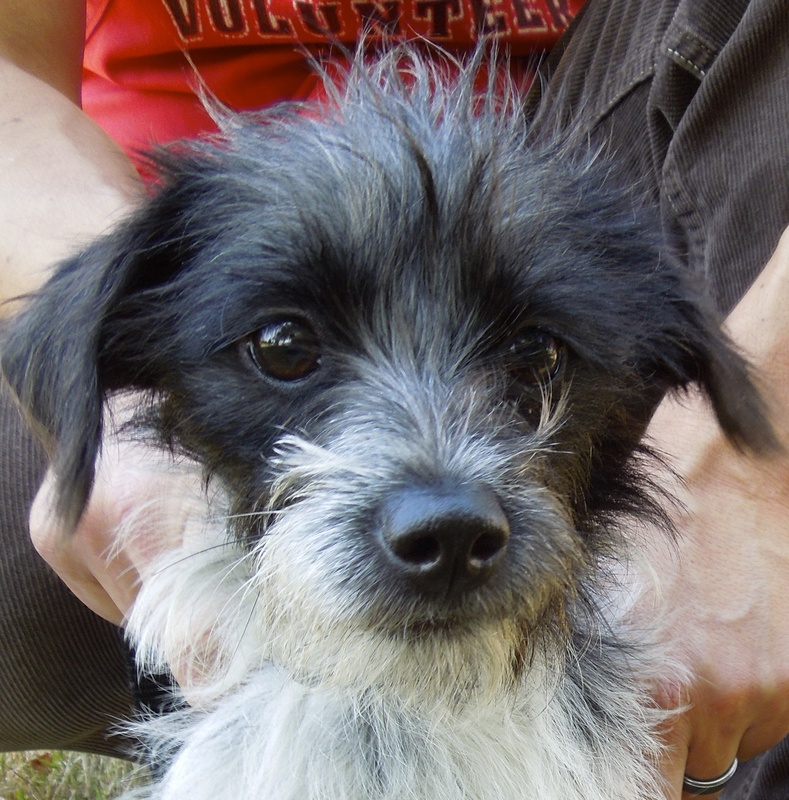 If you’re up for a puppy with all of its joys and challenges, Tim may just fit the bill! He is a happy, eager, life-is-a-ball…”Yikes! Did you see that leaf move?” kind of guy. The folks here don’t understand why I haven’t been adopted yet! 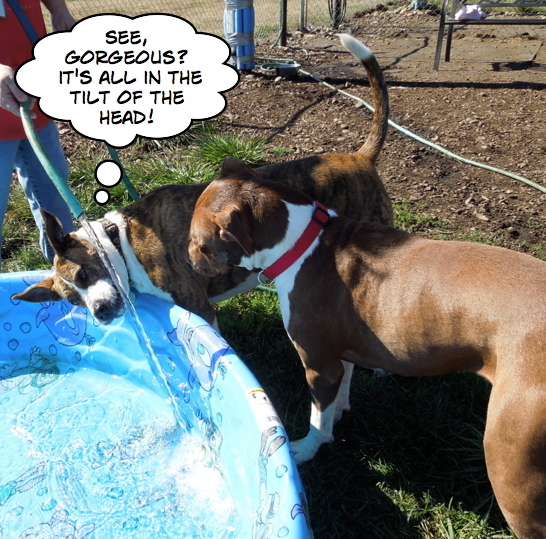 That’s right, many of us volunteers are amazed that Jersey is still waiting for her forever family. She is a three-year-old Bull Terrier mix. She loves people, but is a bit picky about her dog friends. She walks well on leash and is treat-motivated. 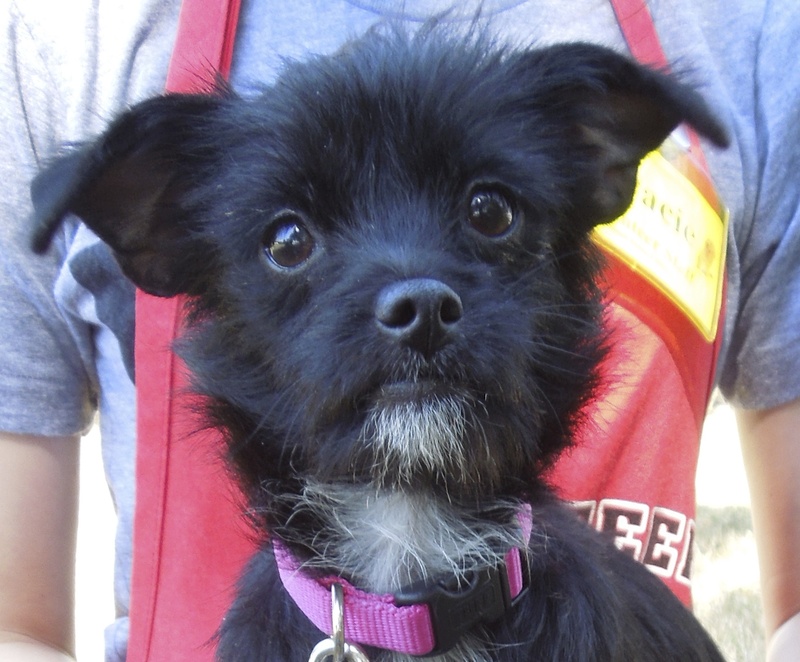 She will make a great hiking or jogging partner in an active family. She’s been at the shelter since July 26. Here she is with Sarah on Sunday. We are all hoping she’ll have a family of her own soon. Yep! I’m really this cute! Every once in a while a dog just likes to pose for my camera and it’s so much fun! 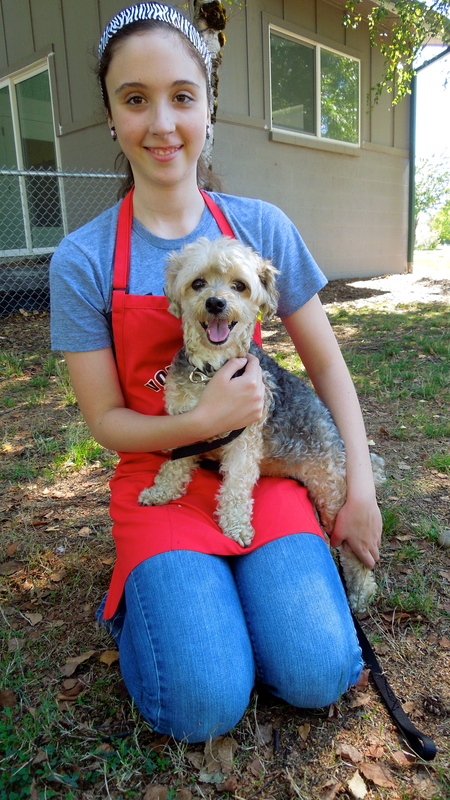 This is Buttons, a three-year-old Toy Poodle/Yorkshire Terrier mix. She was a little shy and overwhelmed in play group, but she really enjoyed sitting in volunteer Gracie’s lap and smiling for me. She loved my hot dog bits and is a delightful little dog. I have a feeling she’ll be adopted very soon. Here she was in play group, deciding to watch from her chair. I’m a little shy, but be patient with me and I’ll gain confidence! 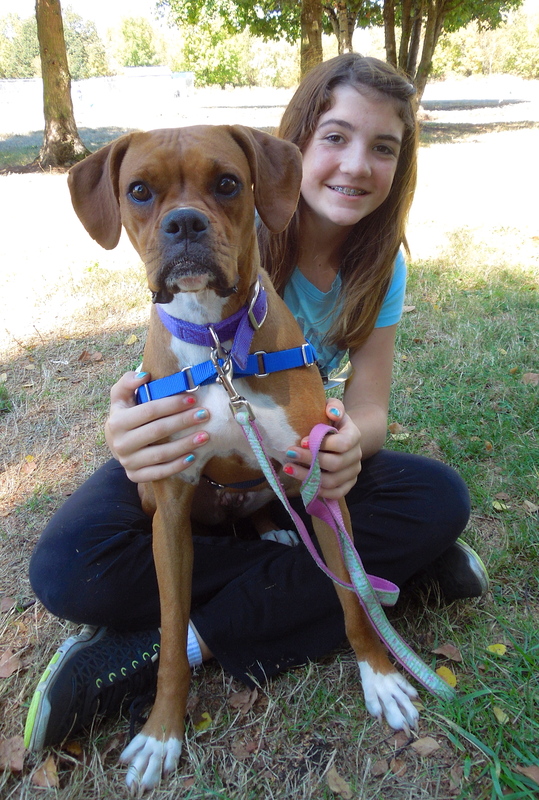 Lacey is a three-year-old Boxer mix whose coat is amazingly soft to the touch. She is very sweet-natured, but also nervous around new people and things. She will need a gentle, understanding family. 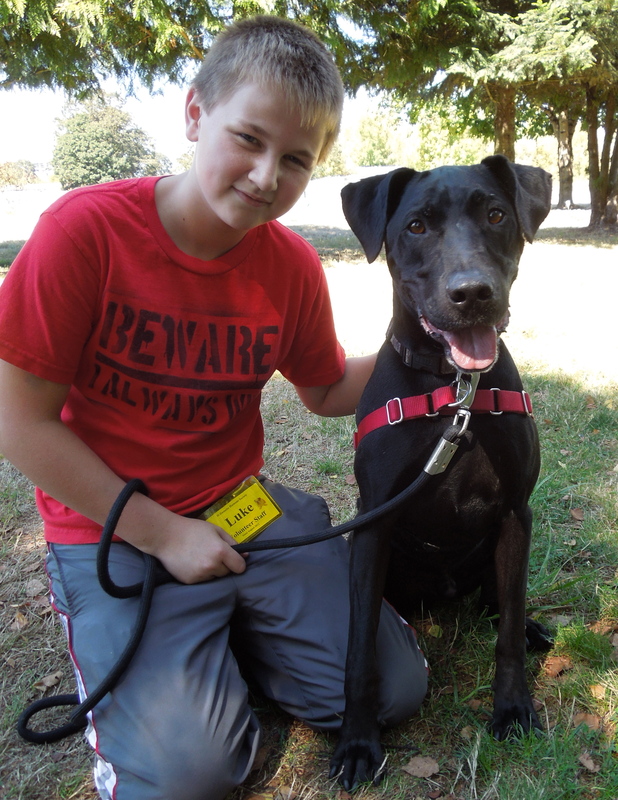 Training classes at WHS would be perfect to help build Lacey’s trust. 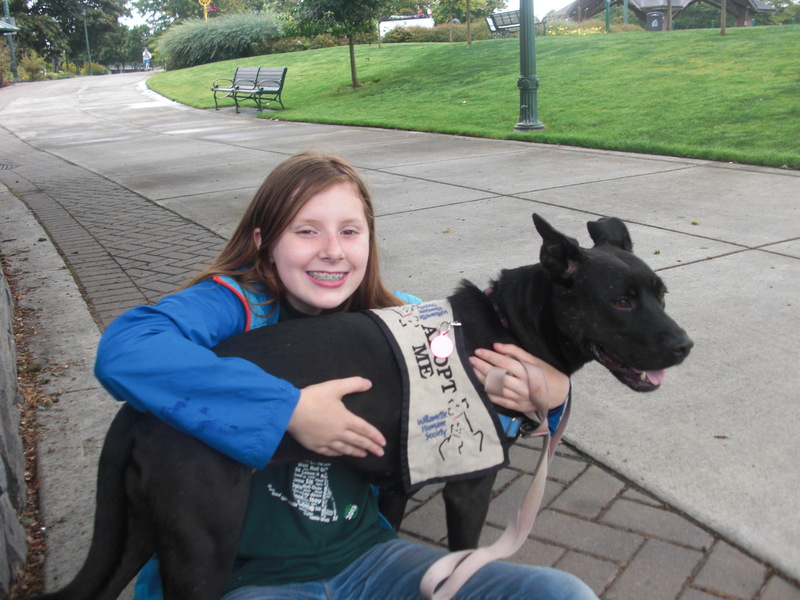 Here she is with volunteer Madelyn, whose kind touch encouraged Lacey to relax. This is one happy dog. His name is Smokey and he is a five-year-old Lab/Shar Pei mix. True to the Lab in him, he is very energetic and would do best with an active family. He is good with children of all ages and adults. He loves to play, but will also settle down to hang out with his people. He will be a terrific family dog. Here he is with volunteer Luke. We’re six months old and boy are we adorable! 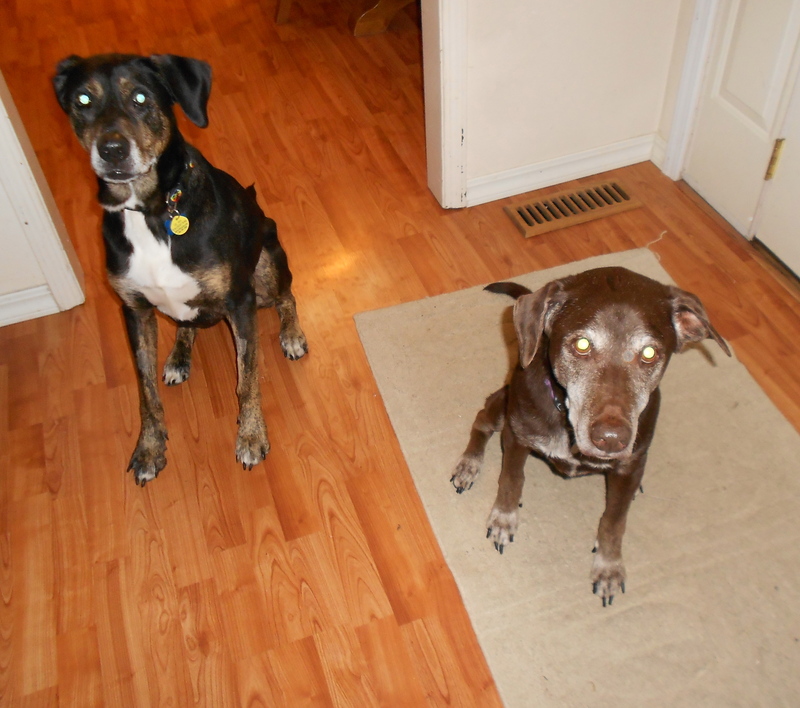 Check out these two Terrier mixes, Maria and Lucy. Trying to get them to pose for my camera was no easy task. 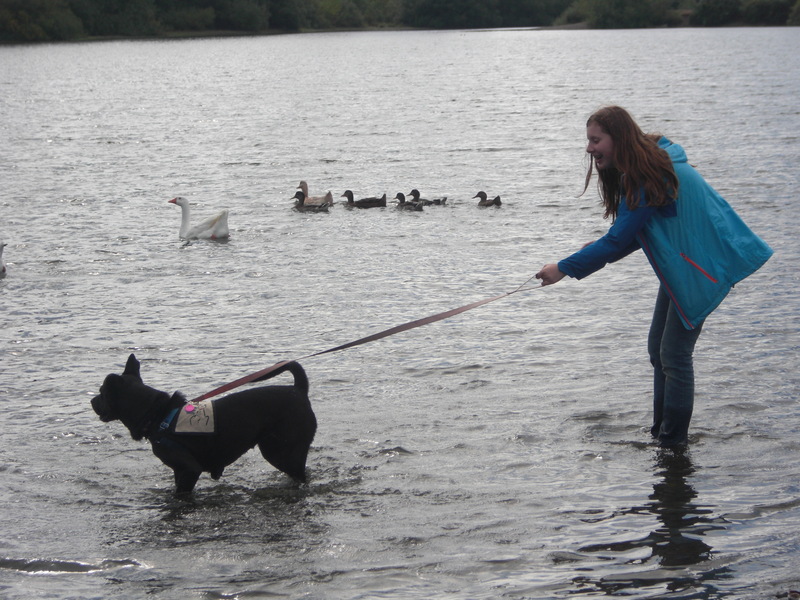 But volunteers Gracie and her dad did their best to help. 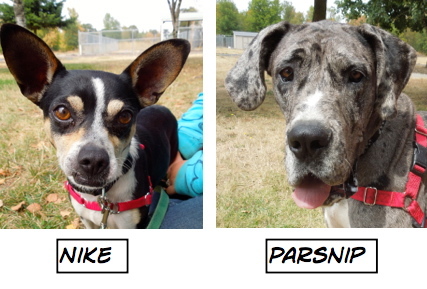 Both puppies are slightly timid but they enjoy attention and will blossom in a loving home. They also would benefit from WHS training classes to build confidence so they will grow into great family members. What? Think a little cone bothers me? Not a chance! 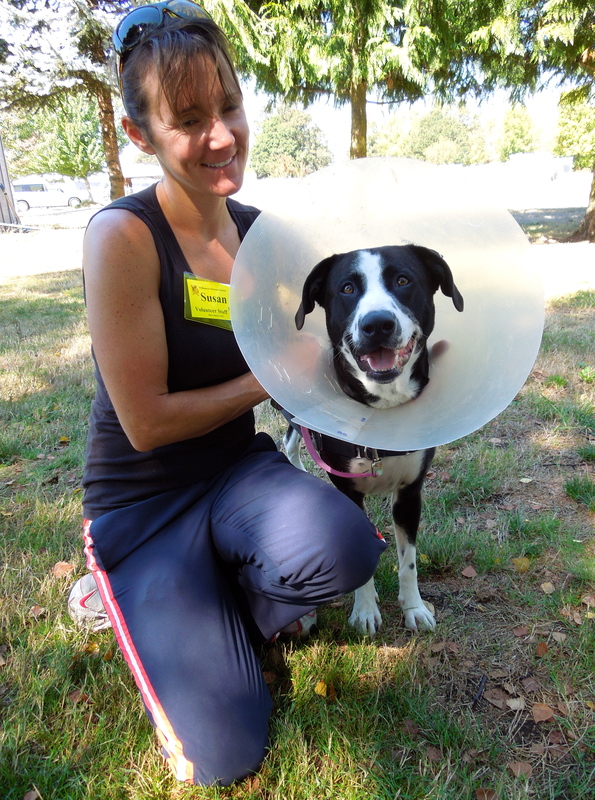 Not many dogs walk around smiling while wearing a cone. 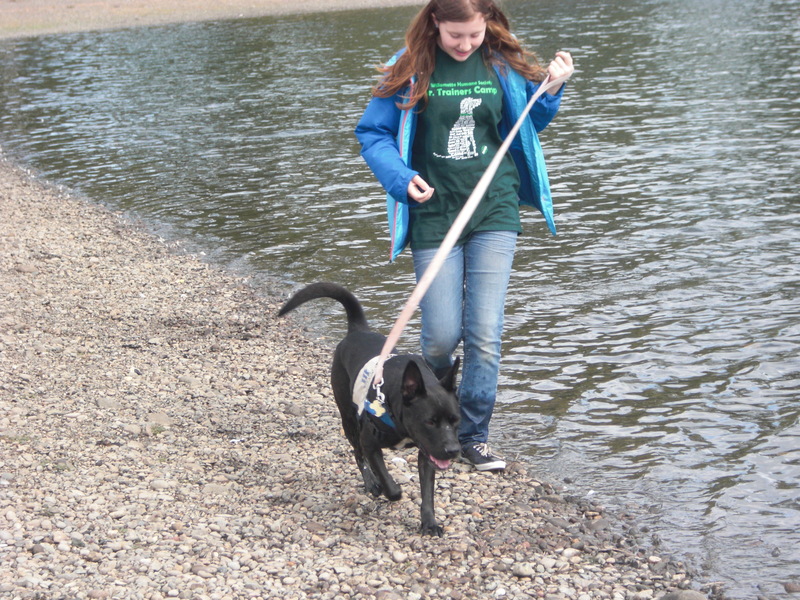 But Jazzy, a two-year-old Lab mix, doesn’t let minor annoyances bother her. 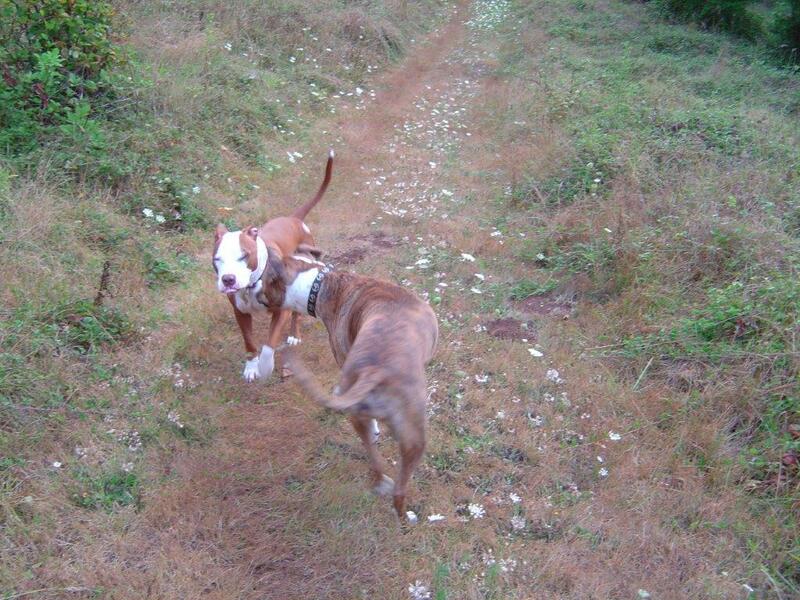 She is a very active young dog who loves roughhousing with other big dogs in play group. She is a rough-and-tumble player with a ton of energy. She should not go to a home with a cat. She needs a secure yard. 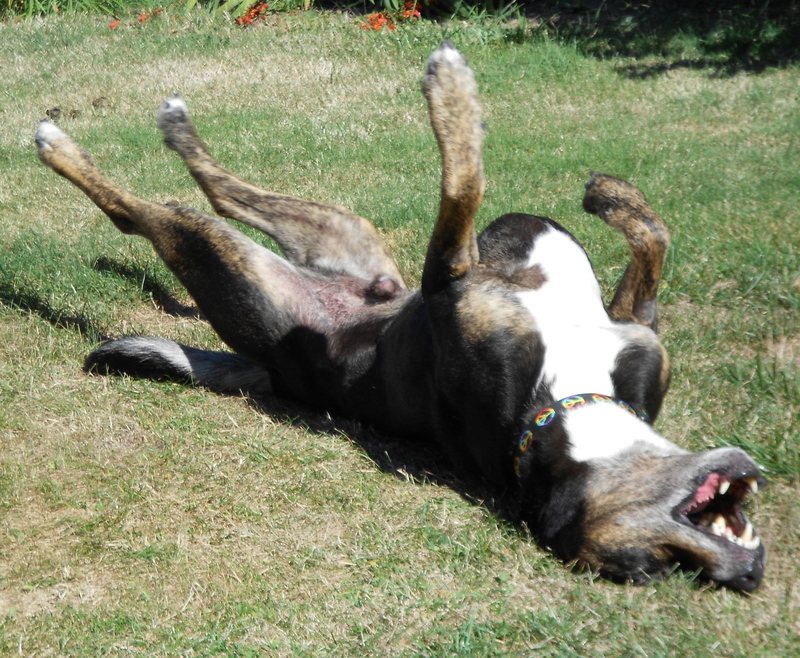 Jazzy is good-natured, is house-trained, and is looking for a family wanting to have FUN! Here she is with volunteer Susan. I may be a little older, but I’m a great dog! 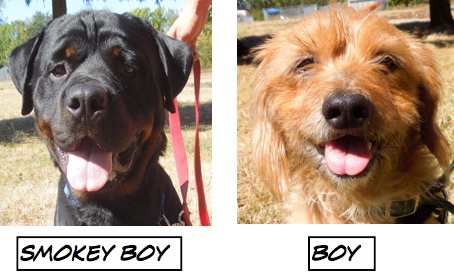 Looking for a laid-back, loyal companion? Khaki is hoping for a place to retire and enjoy being with her people. 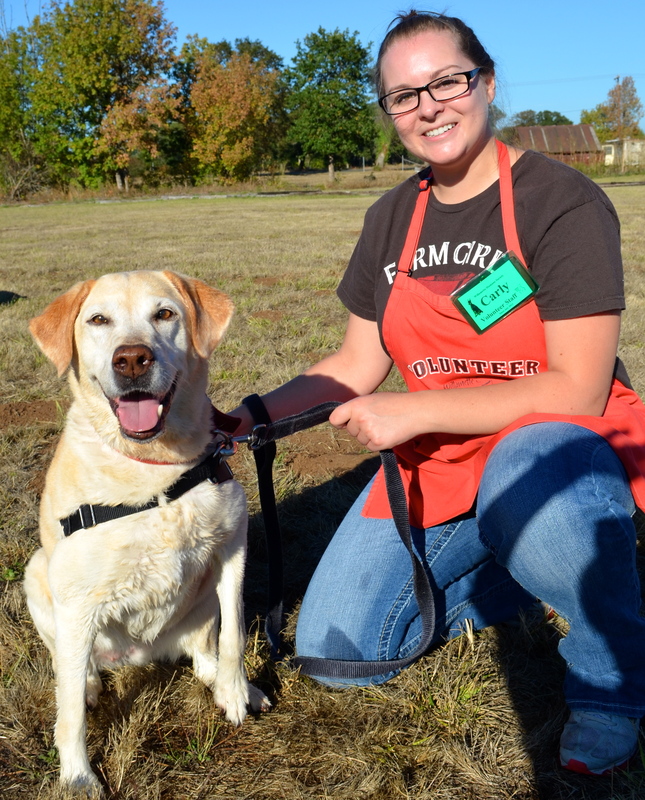 She is an eleven-year-old Lab who loves to go for walks, still enjoys learning new things as long as treats are involved, and dreams of hanging out at her family’s feet in the evening. If you’re a family looking for an even-tempered, happy companion who is searching for a relaxed and calm lifestyle, come and meet Khaki. 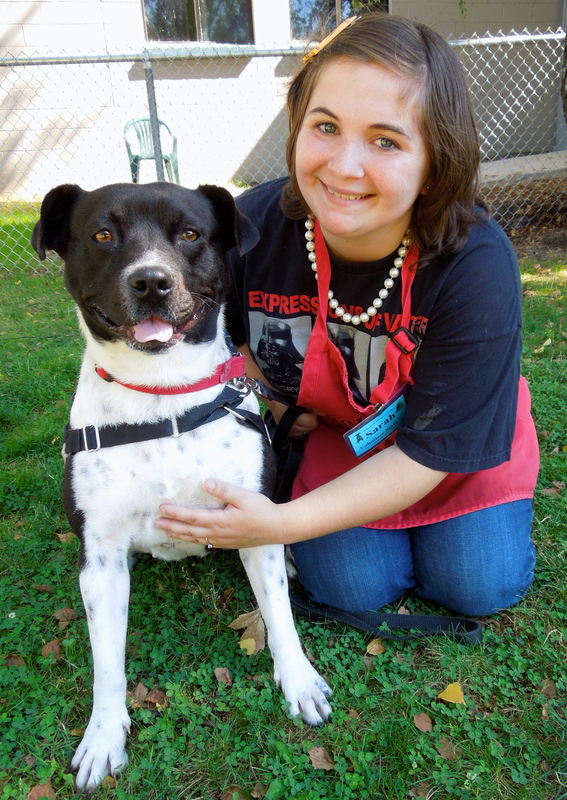 Volunteer Carly really enjoyed her time with this sweetheart. I’m improving all the time! How I love this dog! Faye is still waiting for her forever family. 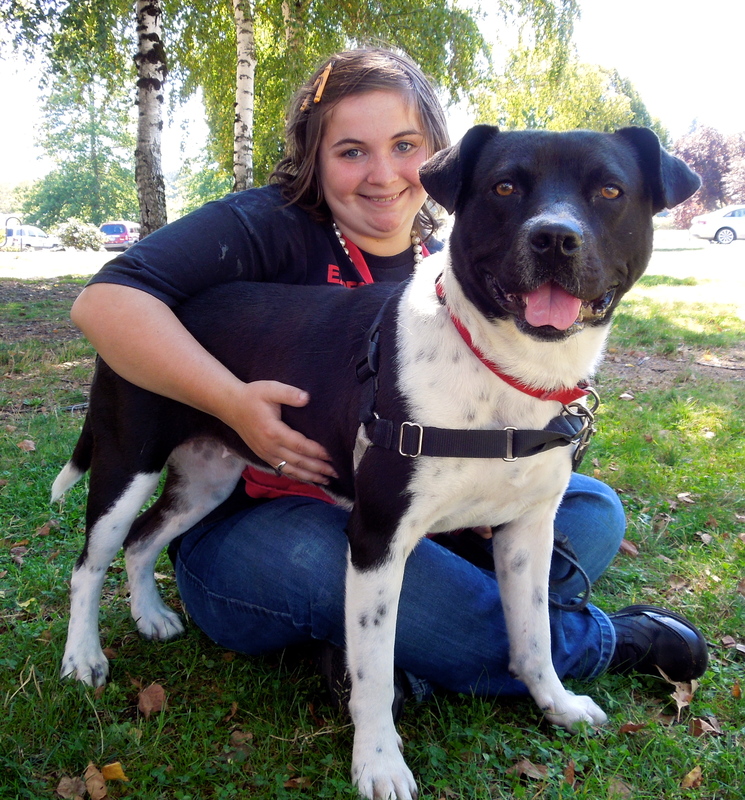 She is an energetic, affectionate two-year-old Pit Bull Terrier mix who is a California S.T.A.R.T. rescued dog. 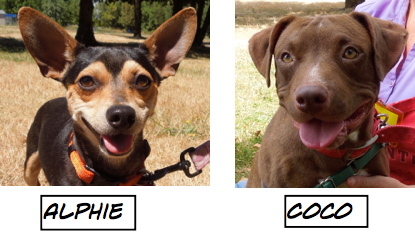 As you’ve seen in play group pictures she LOVES to romp with other dogs and is very appropriate in her play style. 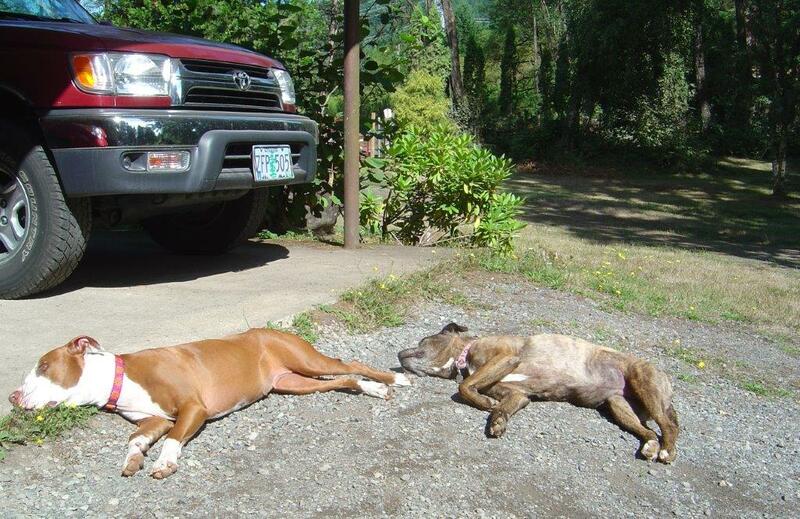 She is not bossy or pushy and is in tune with other dogs’ signals. 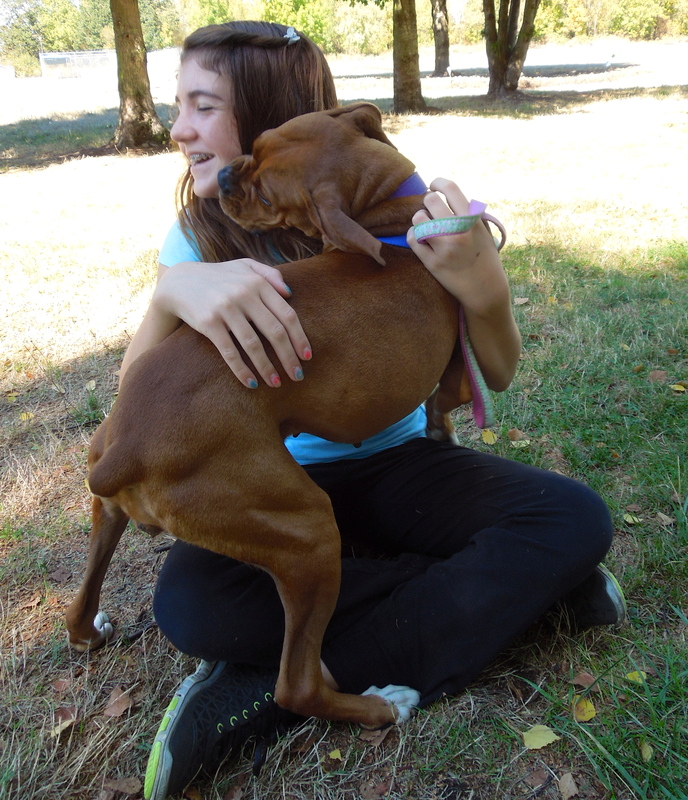 She also loves people, though she can be a little too exuberant at first and is working on some impulse control. Faye is a fun-loving, goofy, happy girl. We worked together in one of Annie’s training classes and she was wonderfully cooperative and eager to understand and do what I was asking of her. The family who adopts her will be very lucky! 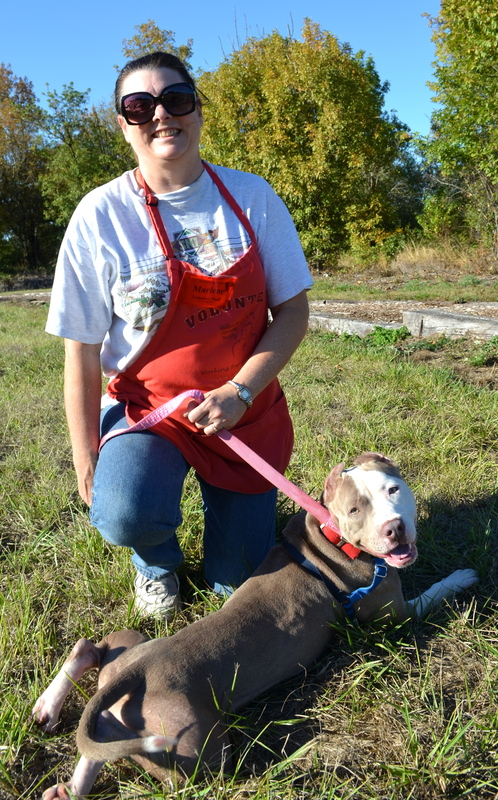 Volunteer Marlene had a great walk with Faye during Yappy Hour. I have some fantastic updates this week. 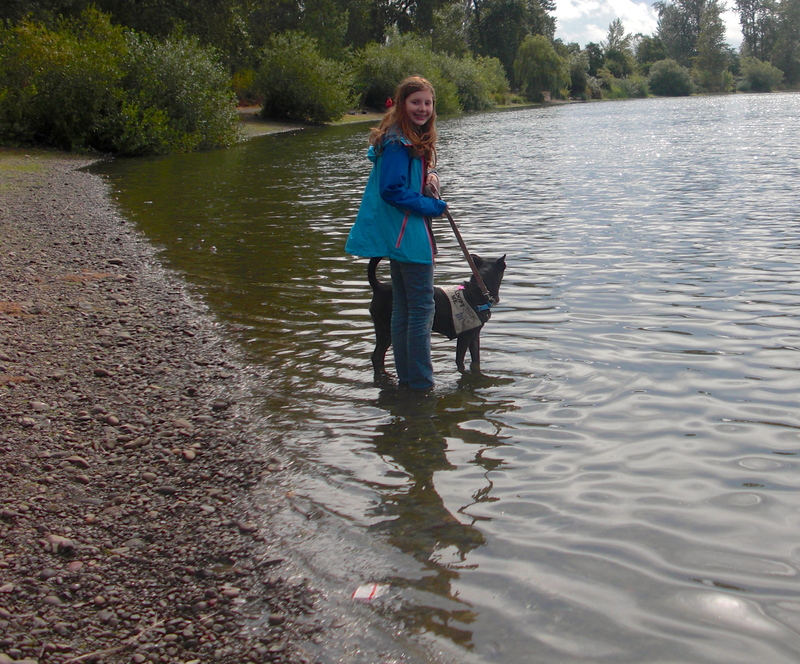 Laura wrote the following about Pony’s adjustment to living with new sibling and former WHS long-termer, Jake. 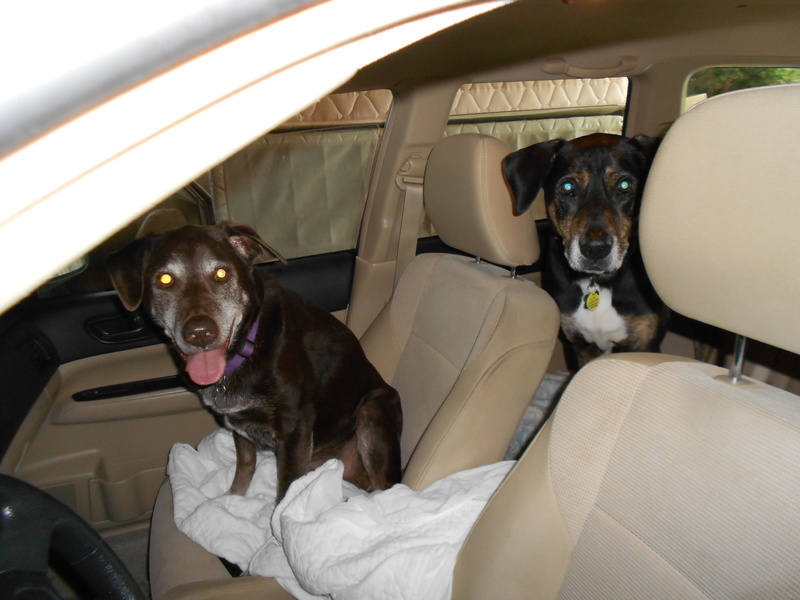 “I really encourage and advocate adoption of older pets. I am totally sold on continuing to adopt older dogs and cats, especially those that seem to linger a bit longer and have a harder time finding their forever homes. ‘Pony’ has been home for a week and has settled in well. It is surprising how similar he is to my other dog, Jake, in appearance and behavior. 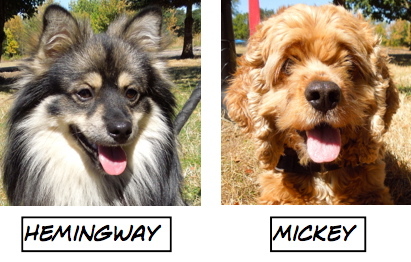 They both bark quite a bit when excited and ‘Pony,’ as we know, likes to howl. It can be quite a cacophony at times!! He has had a busy week as he has been to the vet and got a good report. He has had a bath and flea treatment and only needed a little encouragement to get in the tub and was very good about getting washed. He has gone for walks around the neighborhood and ridden in the car several times. He likes to hang out in the back yard while I do yard work and he especially enjoys rolling around in the grass scratching his back. He immediately found a dog bed that Jake never uses and has claimed it as his. He occasionally joins Jake and me on my bed. One morning I woke up and they were on one half of the bed sleeping tail to tail. Sweet!! The new discovery is that he is kind of a goofball; he can be energetic and likes to chase the tennis ball. He would like to play with Jake, and it seems Jake would like to reciprocate, but he is just a bit too old and arthritic for the rough and tumble play that ‘Pony’ would like. Again, who knew?? I have included one of the few pictures I could get where they actually stayed still long enough for me to get a picture of the two of them. 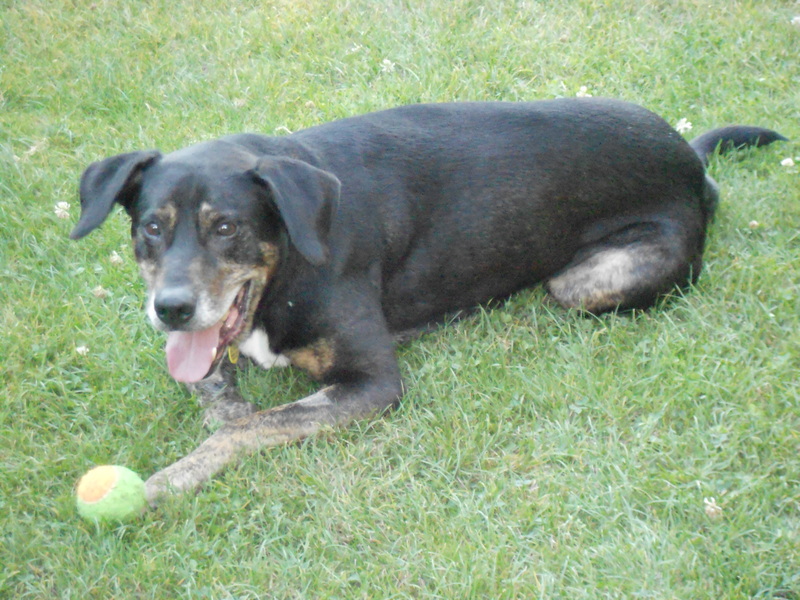 Jake is also a WHS alumnus; I adopted him in November of 2010. What wonderful updates with which to end this week’s post! Always love these stories and to see how much you all are doing for these wonderful dogs! Really enjoyed the video of Yappy Hour, Mart! So glad Liza got adopted. She was so sweet!